I want to start out by saying how realistic and sturdy your bale blinds are. My wife and I met you in Chamberlain about 4 weeks ago to pick up two blinds. We love hunting out of them, they are comfortable and quiet. I have had so many people look at the photos and ask if that is a real bale. Also had people see them in the field and ask if they were real bales. 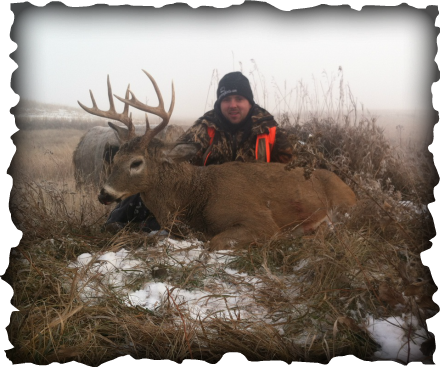 Our slug season ended on Sunday Nov. 11th I wanted to send you a few photos of deer shot out of your blinds. 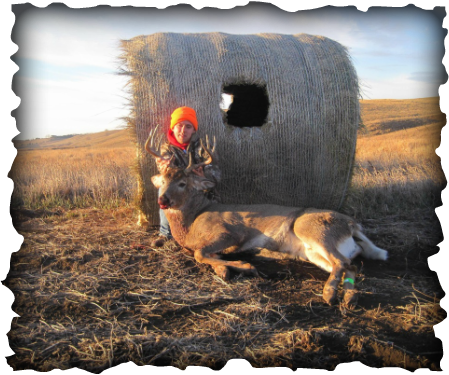 My son shot his first buck on opening day Nov. 3rd. A nice bodied fork horn. 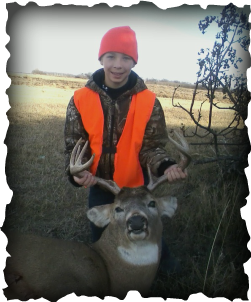 Alex is very proud of his first buck. 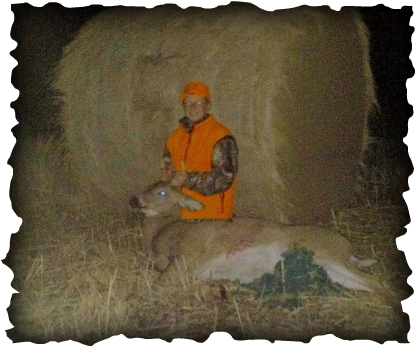 The deer stood 15 yards from the blind eating in the food plot. The last thing I wanted to share with you was if there is any question by anybody how realistic these blinds are there shouldn’t be. Unfortunately we did not get a picture because our camera doesn’t have a large lense on it and it was about 250 yards away. Sunday when we were walking to the blinds it was a blustery cold very windy day. 20-25mph north west wind. We looked at the blind which sits about 3 feet off of a grassy fence line and a small buck was nestled right up to the bale blind on the east side out of the wind. Myself, my wife and my son all saw him. I set out my new Bale Blind Thursday afternoon by myself on the crest of a bluff in the open...took me two minutes and no trouble at all. Saturday morning came with 30mph SE winds. 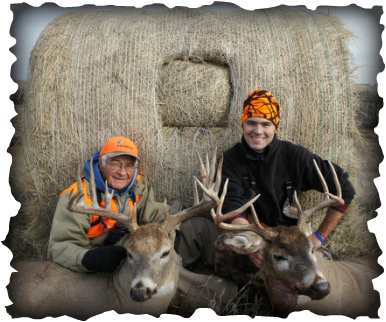 Dad and I sat comfortably in the blind with windows open. A half hour into the season Dad shot the biggest buck of his life...a 171 inch 9x8 at 125 yards after the buck walked across an open field directly downwind of our blind. After the shot we stayed in the blind for about an hour and had smaller bucks and does come to within 20 yards of the blind...they never knew we were there. later the blind is still there as there's too much snow to get the truck to the blind...and the good news is the deer haven't eaten it! So I did what I knew I had to do...I bought another one. I showed photos to a deer-hunting friend of mine, and he bought two. thought I'd need to build a permanent stand to be comfortable...but I can buy five or six sturdy, portable blinds for the price of one permanent stand that I can't move! You've got an excellent product here...Dad and I are sure happy I called you! 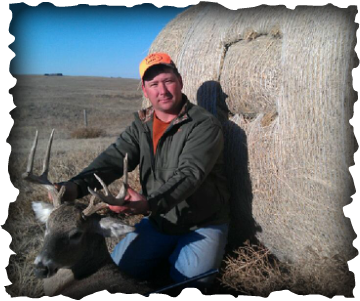 I am having a blast hunting from your hay bale blind! I placed it near an open cornfield where I couldn't have hunted otherwise. The deer never knew I was there and I had numerous shot opportunities every time I went out. I was really impressed with this blind when the wind blew 45 mph one night and it didn't move an inch. The extra windows were awesome, as they allowed me to keep a 360 degree watch over the area. My kids beg me to go hunting now! This blind is awesome! 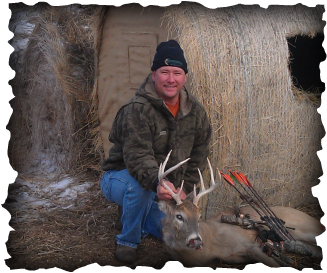 Hey Adam, I just thought I would send you a couple of east river deer taken by my son(13) and I this season. 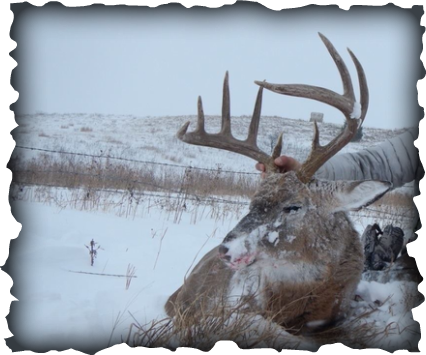 Hunting out of the bale blind makes hunting in cold weather a dream. 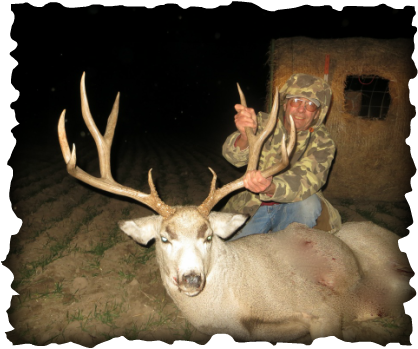 You can hunt much longer and conceal your scent much better. We had some nasty winds come through and the bale stayed in it's place. Thank goodness as I was sitting in it. The blind works great! It is built to last in our windy state of South Dakota! Hopefully next year I will get to try my bow out inside the blind but I sure am satisfied with my purchase of my prairie blind! 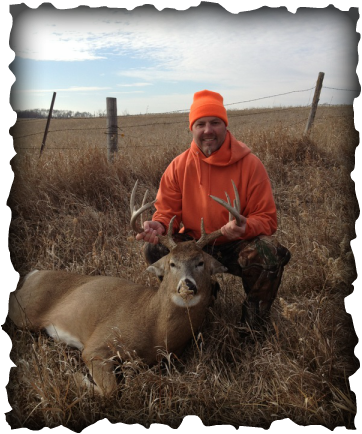 I shot this whitetail deer 45 yard right behind the blind. It was a cold windy morning. He was with a doe and neither of the two smelled me, which was great as the blind was up wind from them. That is just the true test from these blinds. We set the blind in this spot the previous afternoon, deer just do not pay any attention to another round bale in their area. Plus I stayed warm in the blind making it very easy to stay out in the feild all day. 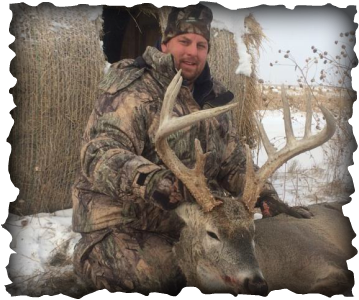 I never would have got this nice mature South Dakota whitetail without the Prairie Hunting Blind!